See the list of more than 20 restaurants participating April 14-20. 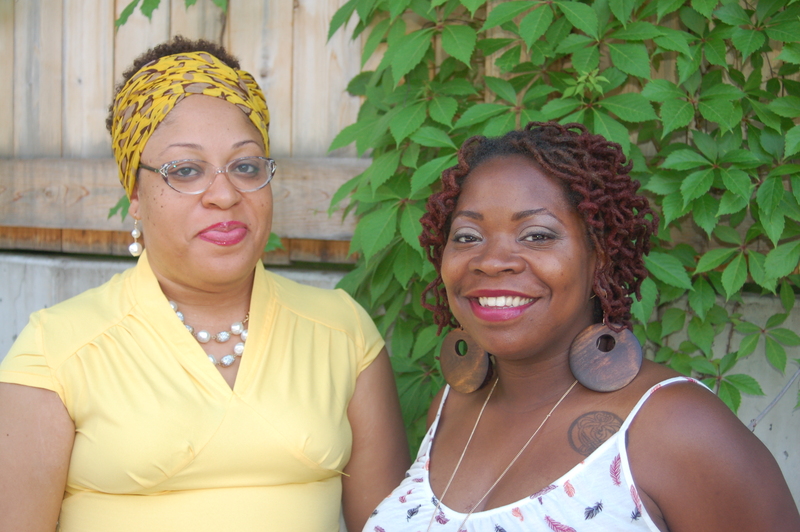 BlankSpaceMKE co-founders Bridget Robinson (left) and Symphony Swan work to build community by supporting creatives and entrepreneurs. Photo by Andrea Waxman/NNS. Here’s an opportunity, and an excuse if you need one, to indulge in great local food and support black entrepreneurship. 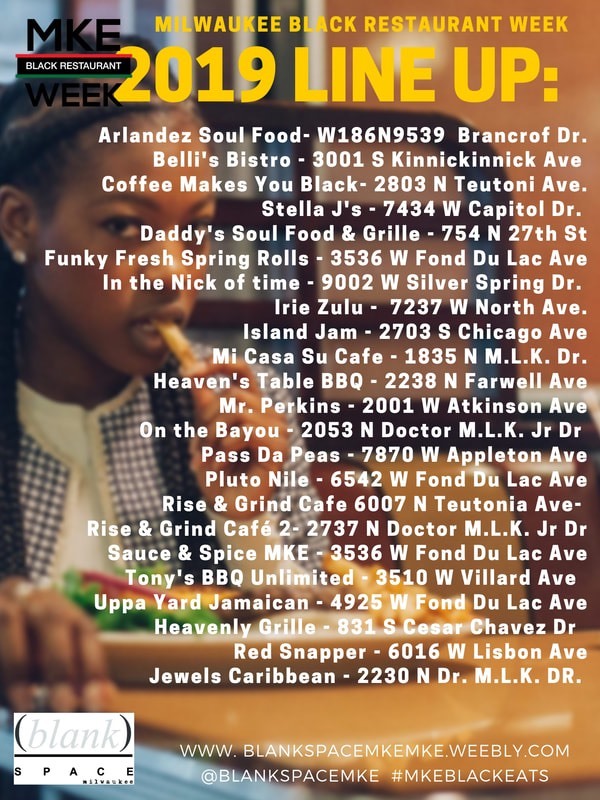 On Sunday, April 14 BlankSpaceMKE will launch its fourth annual Black Restaurant Week. 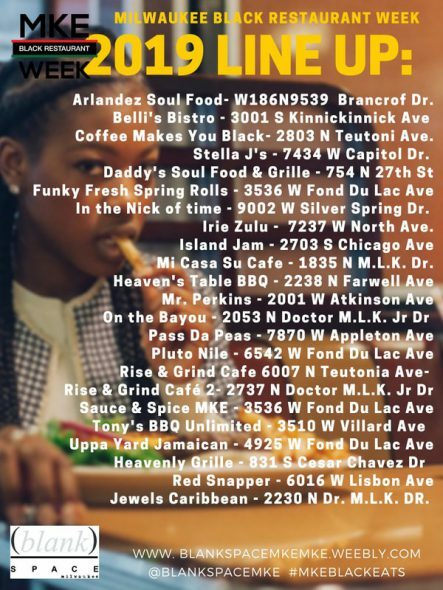 Through April 20, the urban arts organization will promote and celebrate more than 20 local black-owned eateries. You can click on the list below to enlarge the full lineup of participating restaurants. Swan and Robinson also want to demonstrate “the power of the black dollar” and they will give prizes to Black Restaurant Week attendees who respond to a survey on the BlankSpaceMKE website after patronizing a participating restaurant. “Black Arts Week (held in June for the last two years) and Black Restaurant Week are our most significant and prominent programs, but we spend a lot of time doing education in the community,” said Robinson. The two go into schools and help students learn how they can get involved in and support the arts, she said. Last year, BlankSpaceMKE partnered with Black Lens, the segment of Milwaukee Film’s annual festival that focuses on films created from black perspectives, to bring awareness to the festival itself and to encourage folks to support the artists, Robinson said. The public is invited to a free kick-off celebration with owners and chefs from 4 to 6 p.m. Sunday, April 14 at the Bronzeville Collective, 339 W. North Ave.
BlankSpaceMKE also will host a wrap-up forum from 11 a.m. to 1 p.m. Saturday, April 20 at Vibez Creative Art Space, on the second floor of the Sherman Phoenix, 3536 West Fond du Lac Ave.
More details are listed on BlankSpaceMKE’s website.